Firestone Walker Brewing Company out of Paso Robles, CA has been available in the Chicagoland area for less than a year (since January 2011) but they have already made a huge imprint on craft beer geeks in the area. In addition to brewing some of the best beers out there, the brewery also has some interesting Chicago ties. 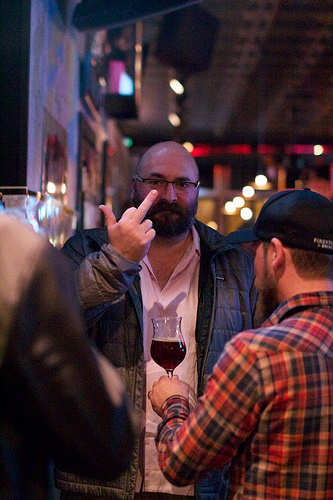 Revolution Brewing‘s Jim Cibak worked at Firestone Walker and learned quite a few barrel-aging techniques during his tenure. And Firestone Walker’s brewmaster, Matt Brynildson, attended the famed Siebel Institute, worked at Goose Island for five years and is a partner at Piece Brewery. So it was not a shock to learn that Brynildson would be in town for a week full of meet-and-greets with some of his newest (and biggest) fans. 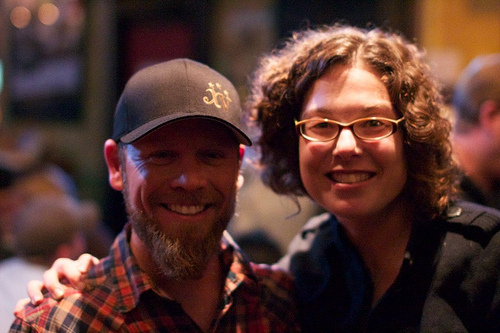 I learned of this and the other Firestone Walker events from Rob Salitore, one of the Firestone Walker sales representatives (or “Pale Mercenary,” as his business card proclaims), that I met by chance a few weeks ago at Maria’s Community Bar and Packaged Goods. 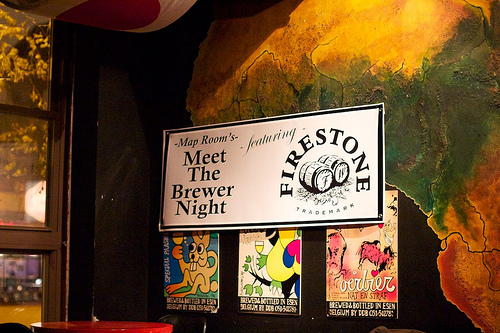 As much as I wanted to attend all of the Firestone Walker events, I narrowed it down to one and chose to go to the Map Room on Tuesday, November 8th since it is one of the best beer bars in the country. And it’s within stumbling distance of my apartment. The hubby and I arrived a little early anticipating the bar to be insanely crowded (as the Map Room typically is) but there were a reasonable number of people present and we had no trouble sidling up to a table towards the back. There were even some sandwiches on offer provided by Pastoral Artisan Cheese, Bread, and Wine for noshing. Nice touch! The majority of the special release Firestone Walker beers were not on tap yet since it was not quite 7 PM, but they did have Union Jack so I started with that. This is a fairly new beer to the Chicago market; Firestone Walker has just recently started releasing six-packs in addition to the bombers that have been available since January. And Union Jack is quickly becoming one of my favorite IPAs. 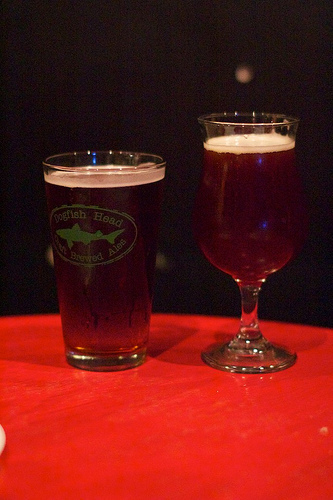 It is a golden-reddish hue and served in a tulip glass. There are bright hops on the nose and a well-balanced hop flavor. This was my first time having it on draft and it shines in both the bottle and on tap. At 7 PM sharp, the special beers were released and the hubby, our friend Daniel, and I got one of each so we could share. The Double Barrel Ale (DBA), the first beer Firestone Walker brewed, is an immensely flavorful, sessionable English Special Bitter that was aged in new oak barrels. It is designed to really showcase the barrel’s flavor by fermenting 80% in stainless steel and the other 20% in the barrel. The Double Double Barrel Ale was rich mahogany in color and smelled amazing; a true testament of a great beer is if you are content just smelling it. This is a dangerous beer; it clocks in at 10% ABV but is immensely smooth with no alcohol burn on the finish. It is oaky with a nice balance of malt and hops. This was my favorite of the evening. The Velvet Merkin was a creamy, chocolaty oatmeal stout served on nitro. My hubby thought it tasted like a White Russian, and that is actually a pretty good description as it had a creamy yet roasty, coffee quality. Daniel said, “It’s like a Guinness, but more flavorful.” There are a lot of flavors intermingling here, including vanilla, coffee, chocolate, and bourbon, to name a few. Unlike the previous two beers that were fermented in new oak barrels, the Velvet Merkin was aged in bourbon barrels so it had a nice hint of bourbon flavor. 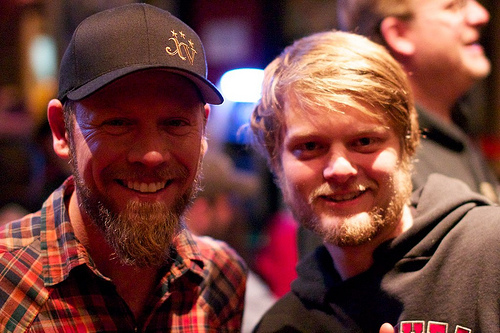 As we were enjoying these brews, we began to wonder how this “Meet the Brewmaster” event would commence. Will Brynildson give a speech? Is he just going to hang out with the beer industry folks by the bar? Just as these thoughts appeared in my head, Brynildson headed over to our table and struck up a conversation. We exchanged pleasantries and he answered any and all of our brewing questions. The pressing question I had after tasting the special releases was whether the DBA would be showing up in bottles around Chicago. Brynildson said that this is not likely to happen, at least not anytime soon, since this beer is very delicate and doesn’t travel well. He further explained that he did not want the quality of the beer to be compromised during the journey to Chicago. This wasn’t the answer I wanted, obviously, but I understand his desire to ensure a quality product for his customers. My hubby, much more of a science nerd than I am, began talking to Brynildson about dry-hopping before primary fermentation is complete. I thought dry-hopping was typically done during secondary fermentation but Brynildson began explaining all of the other chemical reactions that can occur when hops are added before initial fermentation is complete. Fascinating stuff! The hubby and I may try this the next time we brew an IPA. My hubby has often referred to Brynildson as the “brewer’s brewer,” meaning that many brewers we speak to hold him in high regard. We initially thought that there would be a speech but the way the event unfolded was better; you really got to speak with a master of the craft of brewing and pick his brain a bit about barrel fermenting, hops, or any other brewing questions. This was a fantastic event; it was low-key and intimate, and I learned a lot from a real master. If Brynildson makes his way back to these parts in the future, you should definitely seek him out. And tell him to bring some bottles of DBA with him! Bryndilson graciously posed for a picture with yours truly! I couldn’t help but laugh when I read the name “Velvet Merkin”….